Birthmark, by Nathan Jurevicius. Toronto, Canada: Koyama Press, November 2016. 108 pages. $19.95, hardcover. 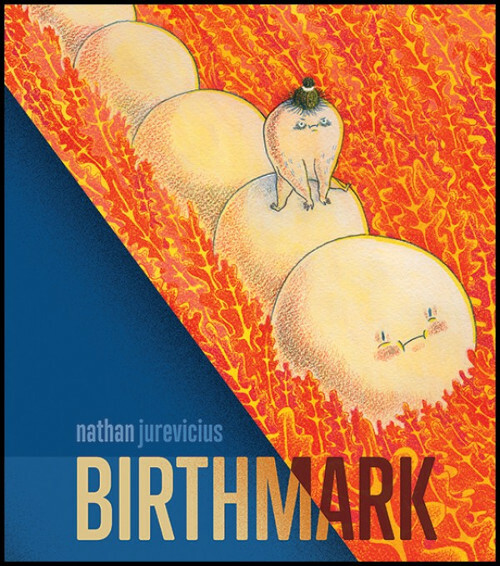 Both whimsical and grotesque, Nathan Jurevicius’ latest graphic novel Birthmark is a take on an age-old story—that of the hero’s quest. The book’s cover reflects this: our hero, a tooth-like creature with tied-up hair, rides a grub through fiery-orange leaves, his eyes intently forward. 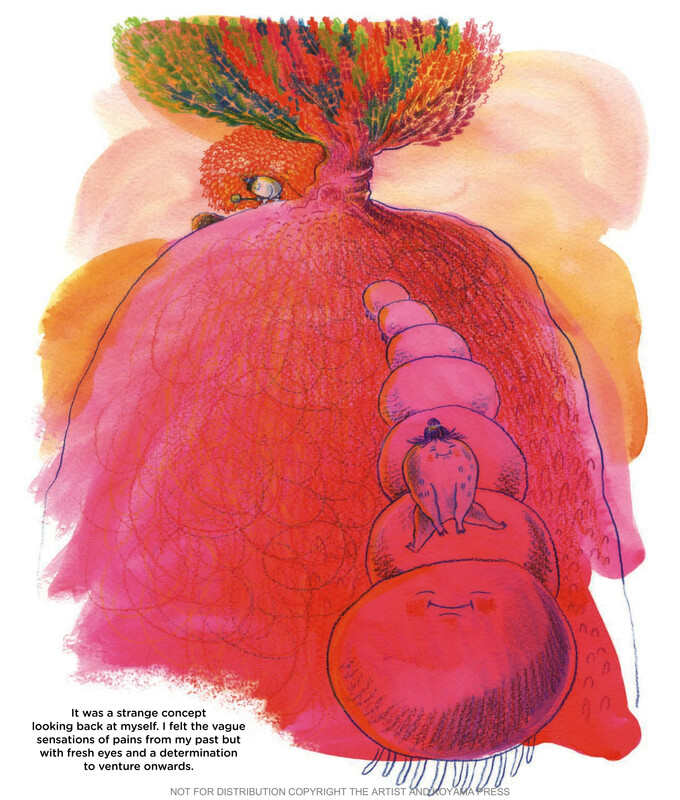 The grub’s cuteness, not dissimilar to a child’s portrayal of a caterpillar, works well in opposition to our hero’s strangely alien body, to the sharp crown of hairs atop his head. Once opened, the pages in Birthmark follow suit, a wonderful clashing of the cute with that of the strange, and it works well. Very well. Ed.’s Note: click images to view larger size. Birthmark follows an unnamed, tooth-like protagonist, born in a slum revolving around the trading of grubs. After a series of misfortunate events—namely the protagonist’s court painter father being executed for his transition into grotesquely realistic paintings of the city’s Grand Inquisitor, and the subsequent indentured servitude of his mother—the protagonist begins his quest. What follows will not be a surprise to anybody familiar with Joseph Campbell’s hero’s journey. Left homeless and vulnerable, our hero and negotiates a series of encounters that test his mettle. These encounters build and build—from being damned by religious fanatics, to illegally smuggling and nurturing a grub, to burying a cloud of souls at the base of a tree. Our hero learns about the world through his experiences, and quite literally becomes a new person. The height of these encounters—the novel’s climax and perhaps our hero’s hardest test—ends traumatically, leaving the reader questioning whether or not our hero would continue. This is, of course, just another of Campbell’s stages, and after a rebirth of sorts our hero continues on to complete his quest and save his mother. Where Birthmark truly shines is in its art and its social commentary. Jurevicius’ style evokes childhood drawings reimagined by a much more experienced artist. Jurevicius eschews the clearly defined panels of more traditional graphic novels, using amorphous swatches of water color washes instead. The nebulous nature of these patches of color are a wonderful continuation of the novel’s whimsy, and the colors in particular—sometimes warm hues, other times cool—always contribute to the mood of a particular scene or panel. Atop the washed out water colors, Jurevicius lines and shades with colored pencil—the technique that makes the art most reminiscent of childhood drawings. Rarely are Jurevicius’ lines perfectly straight, and shading and background coloring is often achieved through what appears to be scribbling. To be sure, this isn’t a criticism. In fact, the linework and shading gives Birthmark a character that I often find missing in the genre. There is something very aesthetically pleasing about Jurevicius’ scribbles, and while they do offer the whimsical character that I speak of, they also show true talent—the shading in particular shows a great competency in light and shadow. One further aspect of Birthmark’s art that stood out as interesting is Jurevicius’ use of the grotesque. Throughout Birthmark there are hints that the story’s protagonist is a microscopic earthling. The grubs, large enough for the protagonist to ride, yet far smaller than some other characters, certainly could be caterpillars. This idea is made even more possible when the reader learns that the protagonist moves into an abandoned atrium, which look quite similar to everyday shelving with potted plants, or when the protagonist passes through a vineyard of “boulder-sized grapes.” These hints towards a familiar setting are quickly overshadowed by a sense of the alien. Characters besides the grubs, for example, are bulbous, top-heavy creatures, with long, plump arms that aren’t necessarily muscular. Similarly, the landscapes, and flora and fauna that the hero encounters on his journey are just as alien. 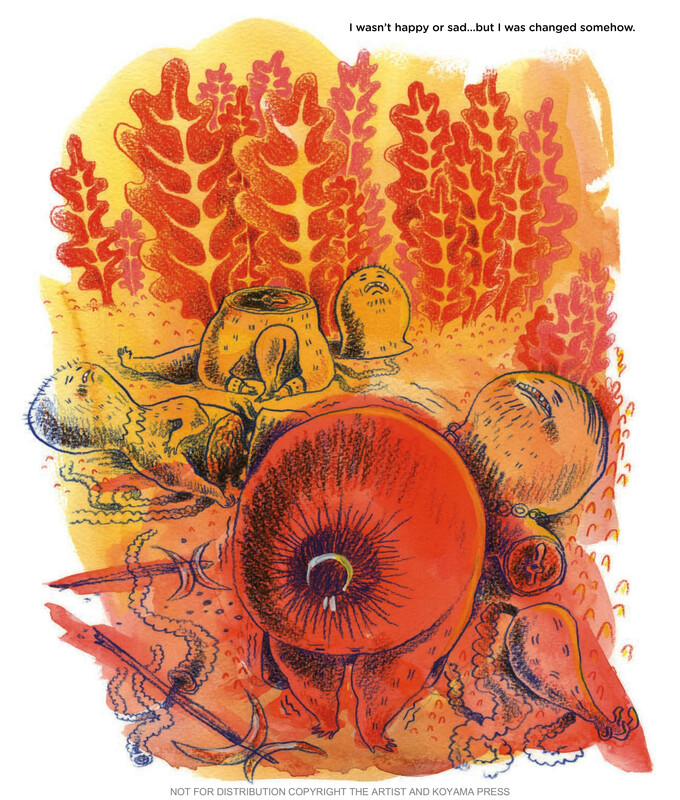 The plants are fiery orange, the mountains have facial features, and villagers are bloated forms of muck. There is nothing cute about these figures, nothing but perhaps the grubs to cuddle. Jureviscius portrays an alien grotesqueness that’s quite compelling. Yet another aspect of Birthmark that felt exceptionally well done was Jurevicius subtle (and not so subtle) social commentary. Throughout the short novel are the implication of sexual workers, religious fanatics, poachers, and otherwise mistreatment toward the innocently docile grubs. The protagonist’s mother, for example, is forced into what is heavily implied as sexual servitude, working “in the inquisitor’s comfort house,” where she is “resigned to manipulating the bulbous bodies of rich clients.” Besides this, we see the enslavement and exploitation of grubs as livestock and racehorses to gamble on; grub wranglers that violently kill the creatures for meat and sport; and a cult-like group that is shamed. 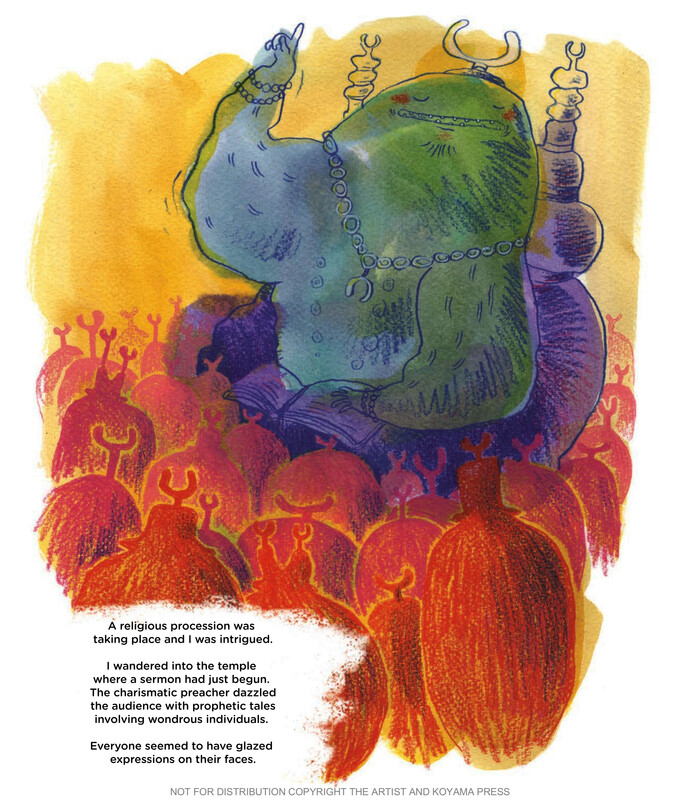 “It seemed that being a willing listener was not enough for the Great All-Powerful Being,” Jurevicius writes, “How you looked and dressed, and most importantly your heritage, was a vital part of worship.” Each of these brief scenes are complex and dark commentaries that contrast wonderfully with the bright and whimsical art of Birthmark. If these themes could be considered complex, though, the novel’s plot could be considered anything but, and that’s where Birthmark left me feeling unsatisfied. As previously stated, Birthmark follows the hero’s journey plotline. There is nothing inherently wrong with this as a plotline, and I still continue to be surprised by how authors make such a classic story fresh, however Jurevicius did not. Instead, Birthmark is the bare bones of the monomyth, which makes the story slightly vanilla and predictable. We expect it when the protagonist faces challenge after challenge, we expect it when he nearly quits his quest, and we expect it when, rejuvenated, he succeeds. The art helps. As does the social commentary of the novel. But the plot itself feels very much so like a vehicle for these other elements instead of an equally important piece of the novel. While I appreciate simplicity, I found myself longing for more complexity out of Birthmark, for just a bit more change in our hero. 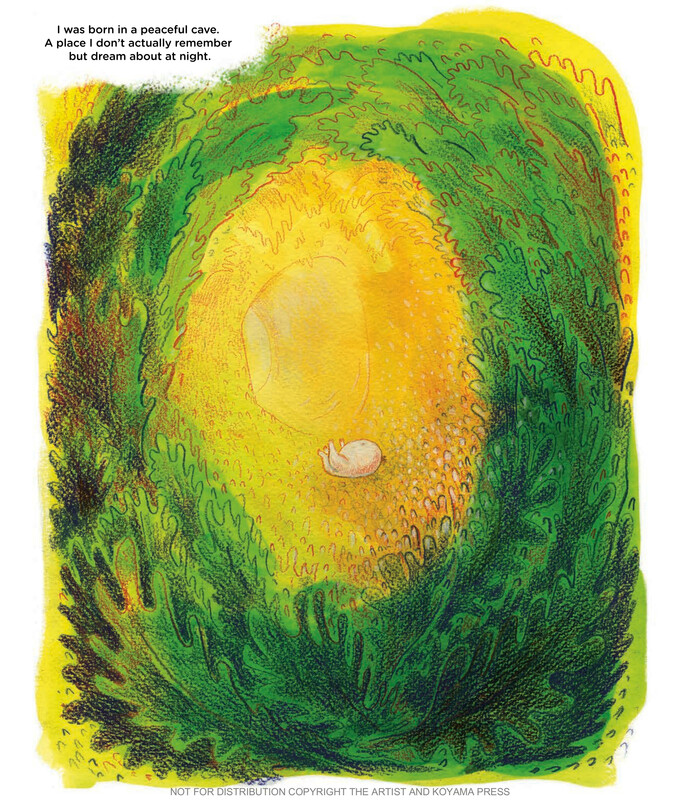 There’s a lot to appreciate in Jurevicius’ most recent graphic novel. Each page offers new splashes of color, and delightfully alien figures. The art of Birthmark is truly something special. It’s beautiful and unique and whimsical, and offers many compelling criticisms of very human flaws. But the plot falls flat, and though I don’t always expect a graphic novel to blow me in away in both art and story, I am always searching for one that does. Regardless, I’m thrilled that Nathan Jurevicius is now on my radar, and look forward to exploring more of his work. Daniel Miller lives in Missouri. His fiction has appeared in Conjunctions, Puerto del Sol, and Heavy Feather Review, among others, and has been nominated for the Pushcart Prize. What’s HFR up to? Read our current issue, submit, or write for Heavy Feather.eather.